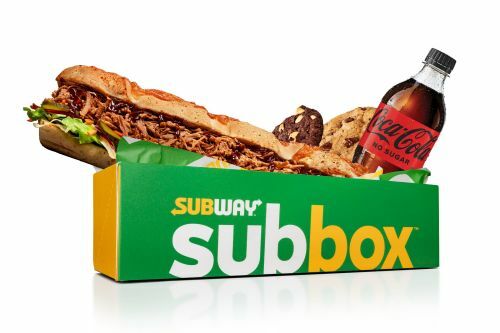 Menulog delivers for Subway- 344 Queen St so you'll be able to track your courier on a map. Turn your favorite SUBWAY® meats and veggies into a mouth-watering salad made just the way you want it. Serves 5-8 people. 5 Subway Footlong Subs for a total of 15 portions. 2 x Smashed Falafel with Tzatziki, 3 x Veggie Delite with Avo. Standard salads and cheeses may include: Lettuce, Tomato, Cucumber, Capsicum, Onion, Olives and Natural Cheddar. Standard dressings include: Pesto Mayo, Tzatziki, Mayo, Ranch, Sweet Onion, Seeded Mustard, Smoky Tomato Chutney and Cranberry Relish. Serves 5-8 people. 8 wraps for a total of 16 portions. 4 x Smashed Falafel with Tzatziki, 4 x Veggie Delite with Avo. Standard salads and cheeses may include: Lettuce, Tomato, Cucumber, Capsicum, Onion, Olives and Natural Cheddar. Standard dressings include: Pesto Mayo, Tzatziki, Mayo, Ranch, Sweet Onion, Seeded Mustard, Smoky Tomato Chutney and Cranberry Relish. Serves 5-8 People. 5 Subway Footlong Subs for a total of 15 portions. 1 x Chicken Breast Strips, 1 x Leg Ham, 1 x Carved Turkey, 1 x Italian B.M.T., 1 x Veggie Delite with Avo. Standard salads and cheeses may include: Lettuce, Tomato, Cucumber, Capsicum, Onion, Olives and Natural Cheddar. Standard dressings include: Pesto Mayo, Tzatziki, Mayo, Ranch, Sweet Onion, Seeded Mustard, Smoky Tomato Chutney, and Cranberry Relish. Serves 5-8 people. 8 wraps for a total of 16 portions. 2 x Chicken Breast Strips, 2 x Leg Ham, 2 x Carved Turkey, 2 x Italian B.M.T. Standard salads and cheeses may include: Lettuce, Tomato, Cucumber, Capsicum, Onion, Olives and Natural Cheddar. Standard dressings include: Pesto Mayo, Tzatziki, Mayo, Ranch, Sweet Onion, Seeded Mustard, Smoky Tomato Chutney and Cranberry Relish. Chicken Teriyaki, 2 x Leg Ham with Honey Mustard, 2 x Roast Beef with Tzatziki, 2 x Italian B.M.T. with Ranch. Standard salads and cheeses may include: Lettuce, Tomato, Cucumber, Capsicum, Onion, Olives and Natural Cheddar. Serves 5-8 people. 5 Subway Footlong Subs for a total of 15 portions. 1 x Sweet Onion Chicken Teriyaki, 1 x Chicken Breast Strips with Pesto Mayo, 1 x Italian B.M.T. with Ranch Dressing, 1 x Carved Turkey with Cranberry Relish, 1 x Leg Ham with Seeded Mustard. Standard salads and cheeses may include: Lettuce, Tomato, Cucumber, Capsicum, Onion, Olives and Natural Cheddar. B.M.T. with Ranch Dressing and 1 x Carved Turkey with Cranberry Relish. Standard salads and cheeses may include: Lettuce, Tomato, Cucumber, Capsicum, Onion, Olives and Natural Cheddar.